Great for smaller closets or smaller moves. Our Wardrobe Boxes make moving your closets simple. Transfer items on hangars directly from your closet to the Wardrobe Box. When you arrive in your new home, simply open the Wardrobe and transfer your clothing to your new closet. 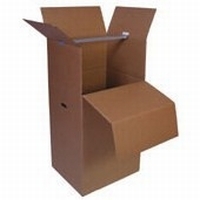 Wardrobe Boxes are ideal for moving shirts, pants, suits, dresses, jackets, and other items on hangars.